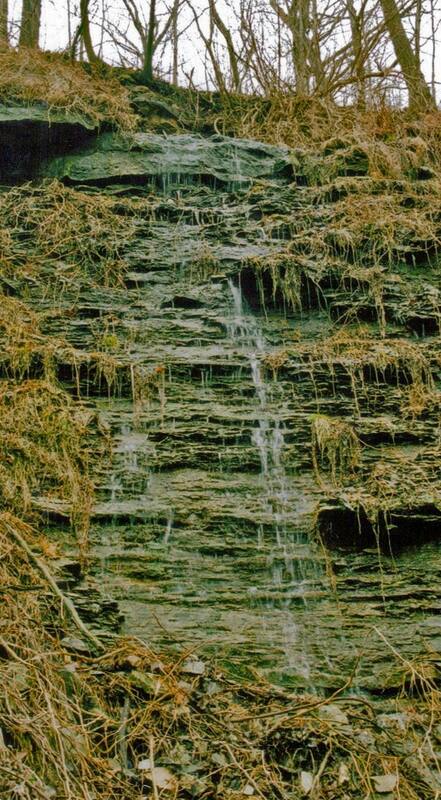 Walnut Grove Falls is a Ribbon Cascade type waterfall. It originates from a crevice in the rock face a couple metres below the top of the escarpment. Walnut Grove Falls was discovered in 2009. Walnut Grove Falls is located on the north side of Mountain Brow Road. It is approximately 50 – 100 metres west of Pritchard Falls. To reach it, look for the next small ditch west of the ditch that feeds Pritchard Falls. 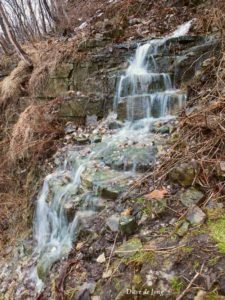 This ditch is not the waterfall, however: you have to climb down a metre or so and then take the narrow trail along the escarpment face westward about 10 – 20 metres, until you come to the top of Walnut Grove Falls. 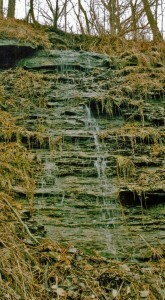 The water originates on the left side from a crevice in the rocks, crosses the path, and then falls down the escarpment.